"Wait...did you say Vampire Mermaids?!" Pirates of the Caribbean: The Curse of the Black Pearl is one of my favorite summer blockbusters. I've loved that movie since the first time I saw it. Of the first two sequels it spawned, Dead Man's Chest was only a small step down but still immensely entertaining, while At World's End was overly confusing and slightly disappointing. Neither of these sequels were bad, but neither captured the magic of the first outing. Pirates of the Caribbean: On Stranger Tides (henceforth referred to as POTC4) unfortunately continues this trend of diminishing returns. The plot of POTC4 is considerably less drawn out and convoluted than the previous two entries. The film opens on Captain Jack Sparrow in London trying to free some pirate friends from certain death. In a matter of minutes Jack is captured, escapes, and embarks upon his next thrilling adventure. 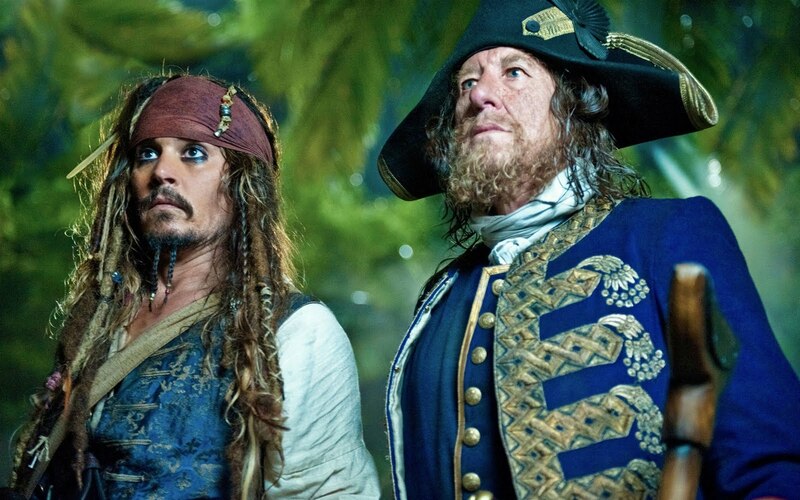 In a nutshell: The Spanish are tracking down a hot lead on the location of the Fountain of Youth, the King of England enlists newly appointed privateer Captain Barbossa to find it before the Spaniards, and Jack gets shanghaied by Blackbeard...who is also looking for The Fountain. You would think this streamlining of the plot would make the movie more focused, faster paced, and shorter. Instead we get a bloated movie with hollow characters and yet another supernatural McGuffin. I really want to make it clear that POTC4 isn't a horrible movie, it's just disappointing. Not disappointing in the sense that I had high expectations that weren't met, but in the sense that almost all of the ingredients for a great summer adventure were there and it just didn't come together. The blame for this lies squarely on the shoulders of the script and the lazy screenwriters who threw it together. 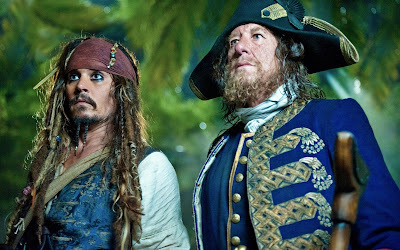 POTC4 is loosely based on the novel "On Stranger Tides" by Tim Powers. In and of itself, this is just a horrible idea. You have an established film franchise populated by iconic characters and you get the bright idea to force these characters into a completely different story? That is madness! It's just like forcing a square peg into a round hole. Something is going to get mangled in the process and neither piece will look the same as it did before. I'm not going to take a fine toothed comb and go through all of the flaws in the film. After all, it is supposed to be a big, loud, fun movie and some shenanigans are acceptable. I do want to touch on a couple of specific examples though. In POTC4 Captain Jack Sparrow is the hero. This is ridiculous. Three films were built around this guy being a scoundrel. He is, you know, a PIRATE after all. This character worked so well before because he played perfectly against Orlando Bloom's goody-two-shoes Will Turner. I never thought I would miss Bloom or his character in this series, but in hindsight a character like that is crucial. In making Jack the hero, he becomes a more subdued, somewhat castrated character. His place in this film is basically to lighten the mood and save the day. This brings me to the Missionary and his story arc. It plain doesn't fit. It feels like a remnant left over from the novel that doesn't make sense in the context of the film. He could have been the character to replace Will Turner, but instead he is wasted on a sappy "love conquers all" subplot that never really starts or finishes. It pops up with no explanation and disappears just as suddenly. The time spent on that character could have been completely cut from the film and absolutely nothing would have changed. There are no two ways about it: The lazy script put training wheels on a franchise that never needed them in the first place, let alone four films in. There are, however, a few sequences in the film that are almost worth the price of admission by themselves. Specifically, the mermaid sequence flirts dangerously close with brilliance. It is scary, funny, and thrilling all at the same time. It is strong enough to make up for a few of the squandered action sequences in the movie. I'm thinking seriously about seeing it again just to see that scene. As far as the 3D goes, I can't really comment. I opted to see it in a traditional presentation and I don't feel like I missed anything other than a few sword stabs at the audience. If you have the option I would recommend seeing it this way simply because there is a good portion of the movie (mermaid scene included) that happens in the dark, and the 3D that I've seen has consistently been lacking in those conditions. The Good, The Bad, and the AAARRGH! While watching On Stranger Tides, I kept getting a sneaking feeling that it was trying desperately (and failing) to be a different movie. A movie I have definitely seen before. POTC4 wants to be Raiders of the Lost Ark so bad it can taste it. It doesn't even come close, though. POTC4 director Rob Marshall is but a mere mortal trying to imitate the power of a god. Spielberg's Raiders is the grandaddy of the summer adventure blockbuster and launched one of the most iconic franchises in the history of cinema. Being such a milestone, there are scenes in the film that are easily recognizable to most people. I can't help but think the "powers that be" behind POTC4 were trying to invoke the same feeling with their movie by including several scenes that smack of Raiders. (SPOILERS/) The one scene that sticks out the most is Blackbeard's death at The Fountain of Youth. It looks and feels almost exactly like the scene at the end of Raiders when the Nazis open the Ark of the Covenant. The characters in both movies are stripped to to bones in seconds, a gruesome death that pushes the boundaries of the films' ratings(/SPOILERS). If you see POTC4 and are left wanting, or if you're just fiending for a great adventure movie, Raiders of the Lost Ark will cure your ills. Congratulations, Renny Harlin! As far as I can remember you're the first director to get two films in my Hall of Shame (the other being in my review of The Rite). Harlin's swashbuckling high seas adventure Cutthroat Island sailed straight into the cliffs and sunk deep into the pop culture lexicon as one of the biggest flops in the history of cinema. Movie studios actually stopped greenlighting pirate movies for years because of this debacle. I can definitely say it is a movie that should be seen, though. It's a continuous train-wreck of a movie and you can't wait to see what goes wrong next. I will also say that some of the action sequences are quite good and has good production values, but neither are anywhere near good enough to make it even resemble a good movie. Pirate movies would be nothing without Treasure Island. Popular pirate catchphrases like "AARRGGH", "Ahoy, matey", and other such jazz were brought to life by Robert Newton in his portrayal of Long John Silver. It is of the classic live action Walt Disney adventure movies like 20,000 Leagues Under the Sea and Swiss Family Robinson. I remember watching it over and over as a kid and loving the hell out of Long John Silver. I wanted to be a pirate. I got the same feeling watching POTC: Curse of the Black Pearl (another Disney adventure movie). If you've never seen this masterpiece, skip going to see POTC4 and watch this instead. You can thank me later. "Did anybody see that? Because I will NOT be doing that again."